Bring a little bit of showmanship to any room with this illuminated star. Caution: Do not leave fairylights unattended when switched on. © 2019 H Read-Baldrey / Quadrille · Reproduced with permission. Cut out a 40cm x 40cm square of both foam board and silver card. Spray mount or glue the silver card to the foam board. Using the template, trace the star onto the wrong side of the foam board. (From point to point, the star should be 39cm long.) Transfer all the markings. Using an electric drill, make a hole through the foam board at each of the 20 points marked on the template. Press the round-ended handle of a wooden spoon into each of the drilled holes to indent the foam board. Press the handle down as firmly as you can (1). Carefully cut out the star using a metal ruler, craft knife and cutting mat. Apply a little extra glue at each point of the star to make sure the silver card is firmly fixed to the foam board. Remove each bulb from the string of fairylights. Starting at one point of the star, place the first socket in the hole from the back of the board. Repeat for all 20 sockets (2). Push the bulbs back into the sockets from the silver side through the board. Make sure the holes are large enough or the bulbs and sockets will not properly connect (3). Cut ten 13cm x 8cm rectangles from the foam board. 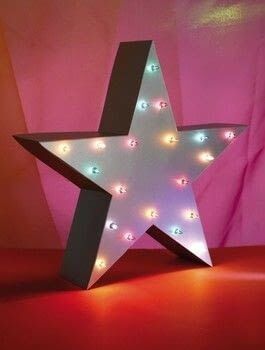 Working your way around the star, fix one rectangle to each side of the star using a hot glue-gun. For added support, use masking tape to hold the sides in place. At the star point that holds the final light before the plug, leave a gap for the cord to fit through. Don’t worry if your rectangles don’t join up perfectly as this will be covered up in the next step. Measure the length of each side of the star. They should be 15cm; if not, adjust the length of the rectangle cut in the next step accordingly. Cut one long 150cm x 8cm rectangle from the silver card. If necessary, this rectangle can be made up of two 75cm x 8cm pieces. Draw a line every 15cm (or the length of the sides of your star) along this rectangle. Score along each of these lines to create a sharp crease. Apply a thin layer of glue to the card then stick to the sides, neatly butting up to the front edge. The creases will fall into place at the points of the star. Cut a small hole in the silver card and feed through the electrical cord.